In 2017 I decided to mix up my running races. In 2016 I had a great season, but I realized I couldn’t keep training at that intensity as my number of kids went from 2 to 4. I would have to approach futures years a bit differently. Because of that, I took 2017 as a chance to experiment a bit with a few major changes. I’ve found that these types of changes can often add fresh life into an old habit. They are familiar enough that it feels like comfortable but different enough that it feels fresh again. They make the future seem expansive rather than defined. 1. 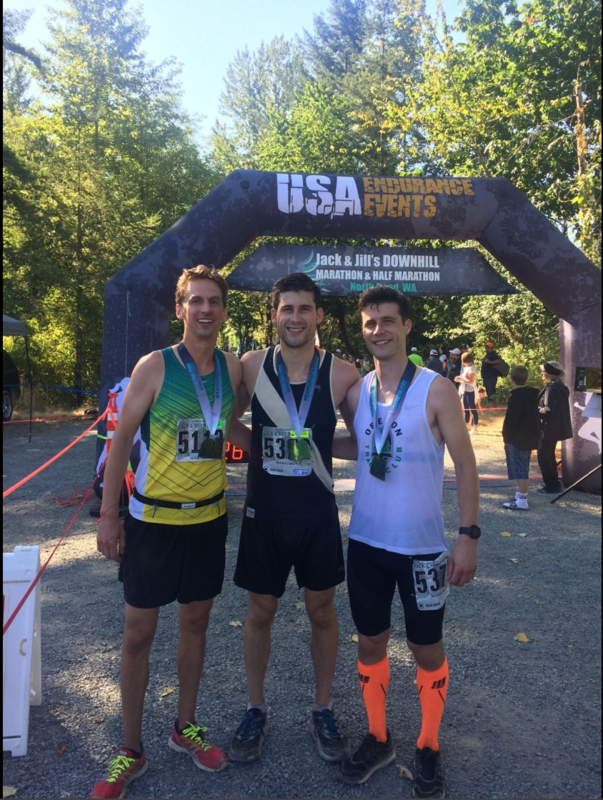 Running A Trail Race – For Christmas 2016 my wife told me she’s sign me up for the Dipsea race, a long-running and unique race that takes place just north of San Francisco. This was my first time racing a real trail race, though I certainly ran offroad some in Cross Country through High School & College. 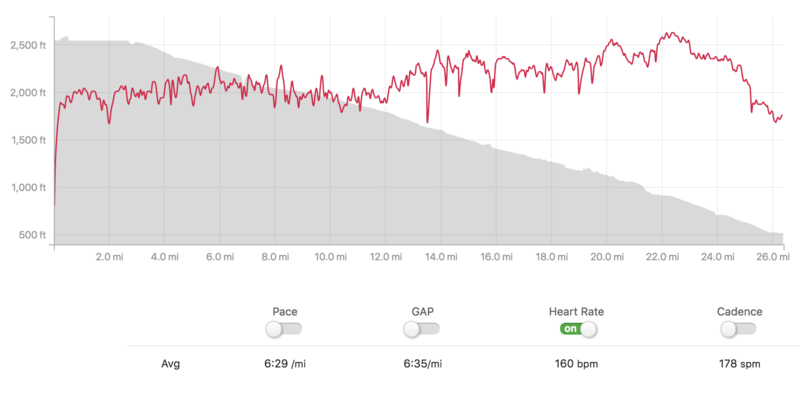 I’ve generally gotten very good at running mathematically during road races – evenly pacing and monitoring my heart rate. I found the fact that sometimes I was running uphill for a whole mile and then downhill for another to be a bit hard to plan for, which made it interesting. It got me out of my head a bit and let me just focus on running as hard as I could. It felt like the old days before I knew so much about my body and I just liked to run. I re-qualified for 2018’s race and intend to run it again. I’ll focus a bit more on training on some trails & hills ahead of the next race and since I’m a return runner, I won’t be so worried about getting lost while I’m on the course. 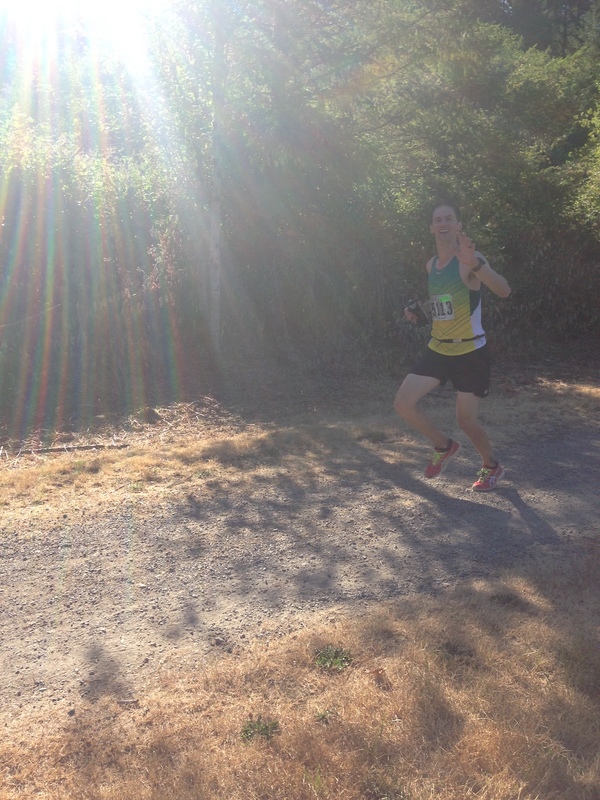 You can read my full race report from the Dipsea here. 2. Running A Marathon on Three Days A Week Training – In 2017 I raced a great marathon off of 6-7 days a week of training. I might have been able to go a bit faster with another season of training like that, but really, what would another minute or two mean? I decided instead to see how fast I could go on half of the effort. The result was that more of my training miles were at a faster pace, I generally felt less worn down and my race was only 9 minutes slower. Most recommendations I see about the long term benefits of exercise mention 3 days a week training as a plateau point, so I don’t want to drop much below that. The only place I see to cut back more is the length of each run. There is probably still a bit more room to drop my miles and increase the intensity. You can read more about my 3 day a week training plan here and read a review of my 2017 marathon here. 3. 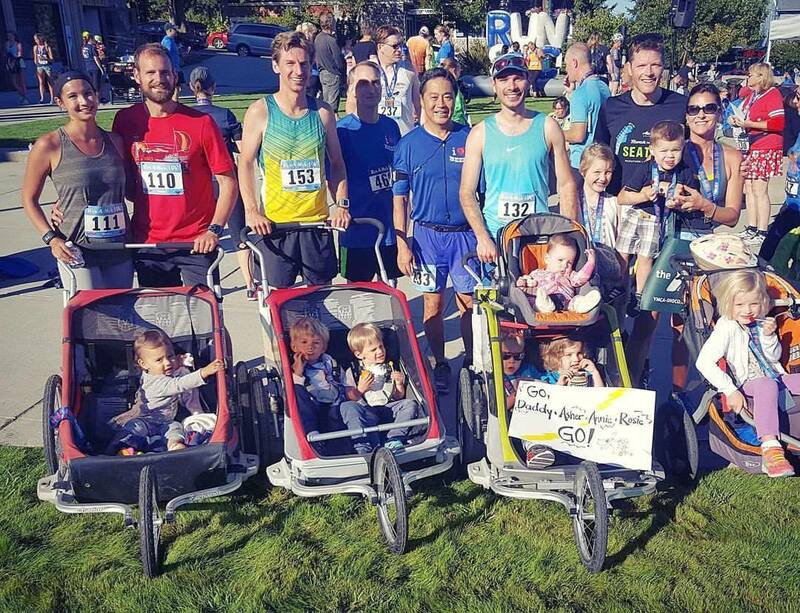 Running A Stroller Race – 50% of my runs in 2017 involved my pushing a stroller. 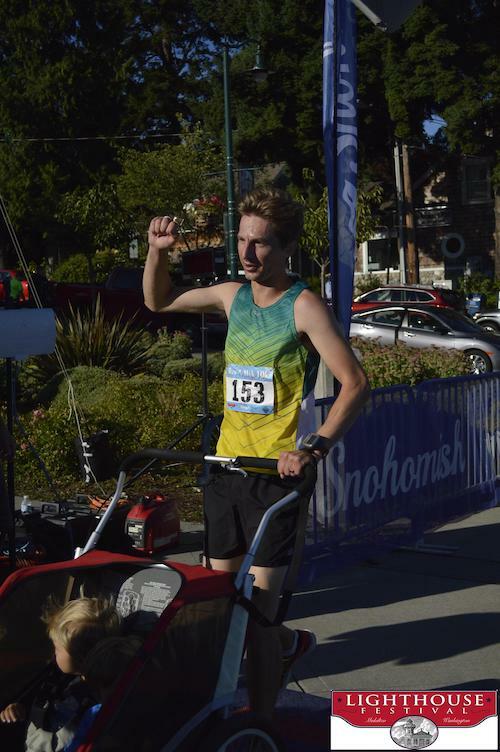 So it was only natural that eventually I would run a race with a stroller. Another dad I know invited me to one he was doing and I got to see what it was like racing with some extra baggage. While it was a lot of fun, this isn’t something I would do every race. It really just ads a lot of other safety concerns and stresses to the day. That said, for some smaller races that are more family oriented and less competitive, this is a great way to add some flavor and keep things interesting. 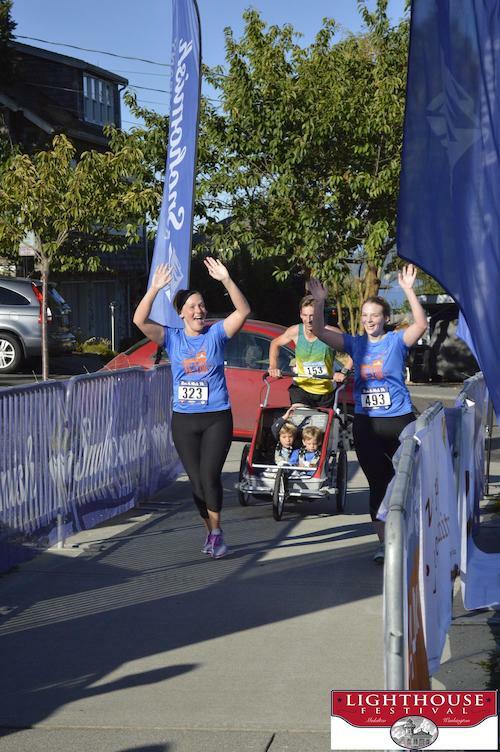 You can read my full race report from my first stroller race here. 4. 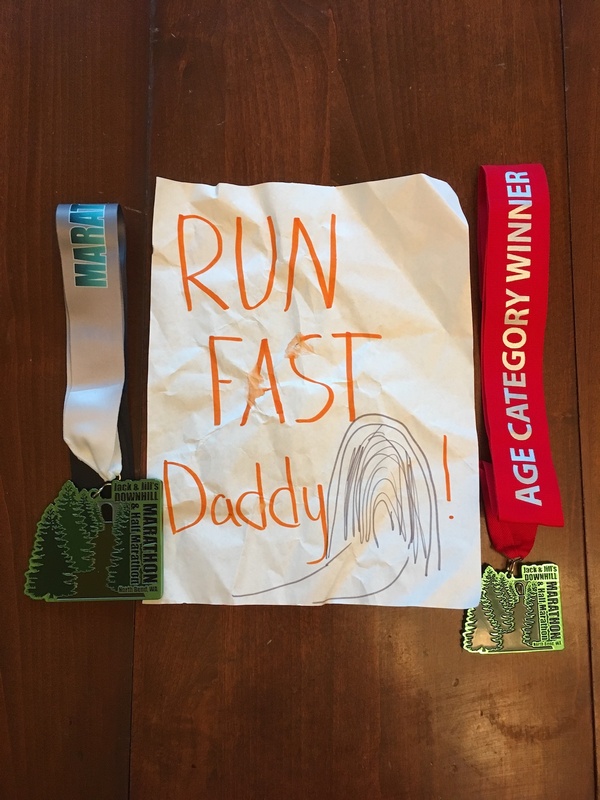 Running A Race With My Kids – After years of watching me race, I finally let my kids get in on the action. While this wasn’t physically demanding for me, it was fun being on the coach, cheerleader and pacer instead of the racer for once. Running with my kids let me get back to the roots of the sport a bit more. It wasn’t about heart rate, calories or cadence – it was about getting outside, pushing ourselves and doing our best to make some good memories. 2017 brought some fresh changes to my running. I’m extremely happy with the resulting enjoyment, even if I’m not as impressed with the resulting times. I intend to repeat all four of these new ways of training & racing in 2018. Stay tuned for results. 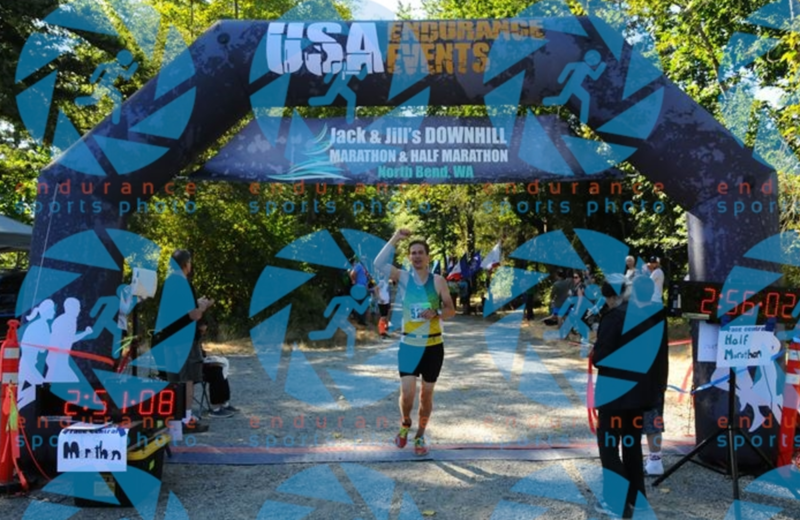 On July 30, 2017 I ran the Jack & Jill Marathon, finishing in 5th place overall with a time of 2:51:07. The guys I ran, Wes & Jonathan Coopersmith, finished in 3rd & 4th place respectively, with times of 2:47:23 and 2:49:02. Here is the race report. This is a race I should be happy with. I didn’t plan on racing this year and only did so to train with my friend Coop so we could get a Boston Marathon Qualifying time for next year. 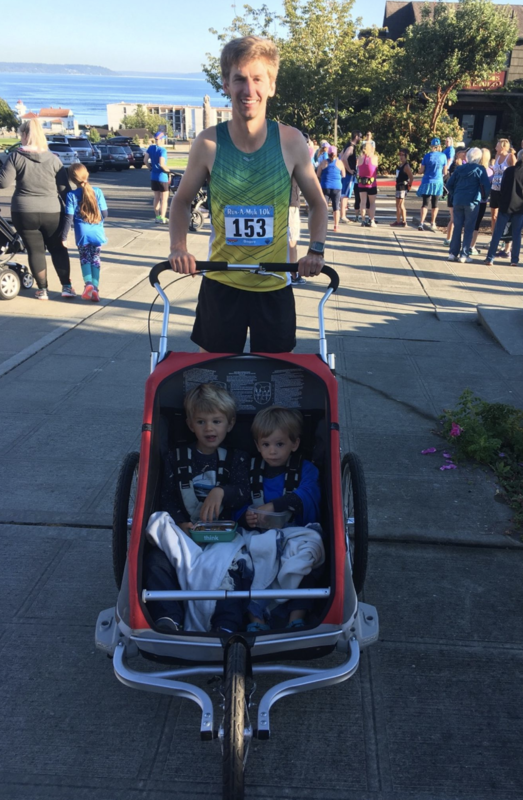 After the time stress of my 2016 season, I had a conversation with my wife and we decided that I should cut my training to three runs per week, 1-2 of which I’d take kids in the running stroller. I averaged just 27 miles (just barely longer than a marathon) each week. Running a 2:51:07 off of that training plan is more than I had expected going into the season when I had hoped I’d be able to get across at 3:02 or 3:03, barely a BQ. That said, I am pretty bummed at how I crashed at the finish. My training ended up going really well and I took the first half of the race very conservatively. I expected I should have been able to finish strong. I’ve crashed during a marathon before, but at least with NYC last year, where my crash was even more spectacular, I have very clear evidence that I just went out too hard. Here it seems like I did everything right and still, the wheels came off one mile to the finish. That is what hurts the most. As I think about future races, I’m less confident in my training and race strategy now. Like always, I hardly slept the night before the race. I just get too nervous. The morning however was very restful as we had it coordinated like a space shuttle launch. Instead of meeting the busses at 3:30 AM, which would have meant leaving the house before 3:00 our group took one vehicle right to the start at 4:30 AM. We had our wives meet us at the finish line with another vehicle. We got an extra hour of sleep because of that and didn’t have to sit around at the start line for a really long time. Due to having run this race last year I had a bit of insider knowledge. We ended up pulling an advanced move and dropping off a bag at the half with a few emergency supplies, extra water & nutrition before we went to the start. I tried a new pre-cooling strategy for this race. I was doing some reading that one of the main inhibitors in longer races is heat accumulation and that the colder it is, the faster runners tend to go. Interestingly, there doesn’t seem to be a point at which it is too cold. This is very different from other races like the 5k where you want to be warmed up and ready for your top gear the second the gun goes off or the 100 meter sprint where you need to be warm so that you don’t pull a muscle. 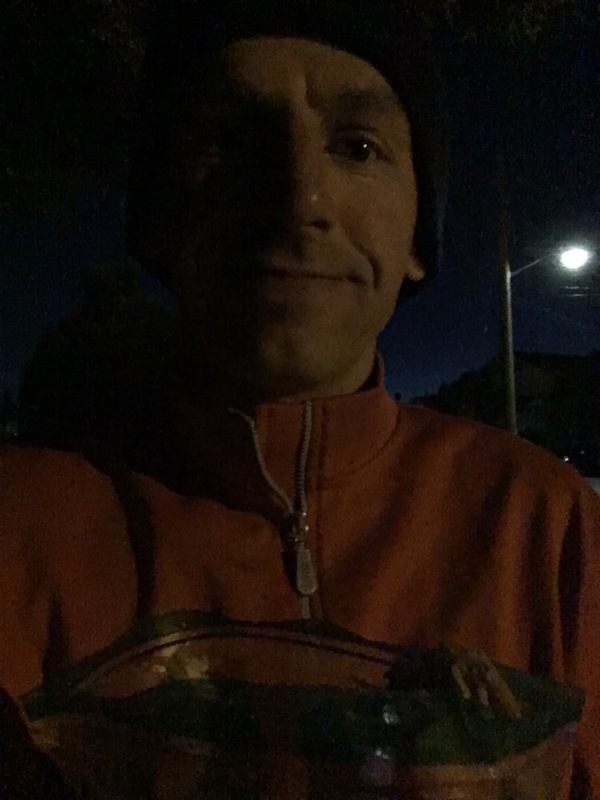 Because of that I tried some pre-cooling – a technique I had read about runners using in races where the temps were in the 70s or 80s, even though it was 50* on my race morning. I drank a slushie of some juice, I wrapped myself in a damp towel that had been the freezer and I held a couple of ice packs against my wrists, where a lot of blood flows. I was freezing. I also skipped warming up, opting for just some light stretching cold. I would use the first miles of the race as my warm up and save the calories for that rather than spending them before the race. Gun went off and our group, Jonathan, Wes and I went out in the front. Two runners ended up going a bit ahead of us by the 1 mile, but we figured we’d see them again – turns out we didn’t, they finished 1st & 2nd and our group got 3rd-5th. Our goal was to split the half at 1:25 – exactly 6:30 mile pace. 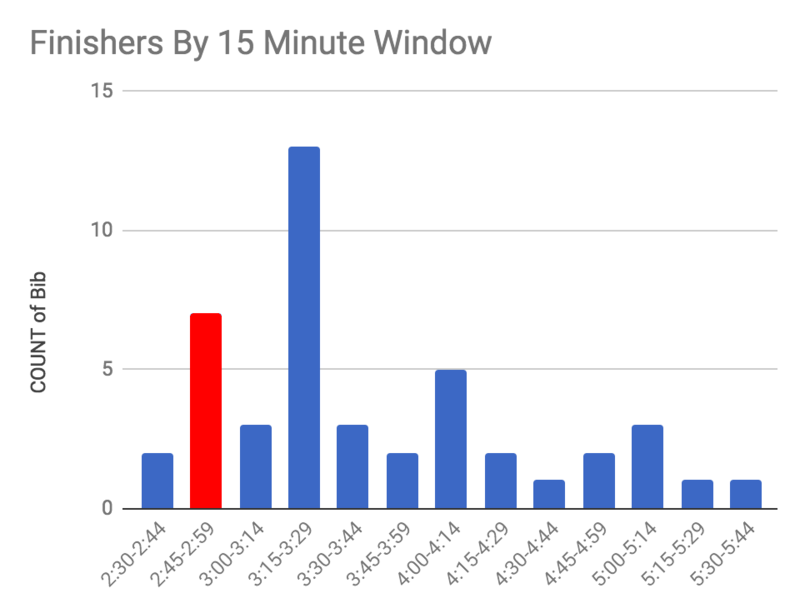 We wanted to do that by running the first few a bit closer to 7:00 pace, then holding just under 6:30s for the rest, maybe dropping a few seconds off mile 12 & 13 to get ready for a faster second half. The first miles felt so easy it was actually hard to go that slow. I’d only ever raced two marathons, one where I was having equipment trouble over the first miles and one where I went out way too fast. So this was a new feeling for me – being in peak race performance, going race pace, and feeling like it was a walk. As we came out of the tunnel they snapped this shot of me doing the banana phone. Yes, I ran the first few miles with a banana and then ate it while running. 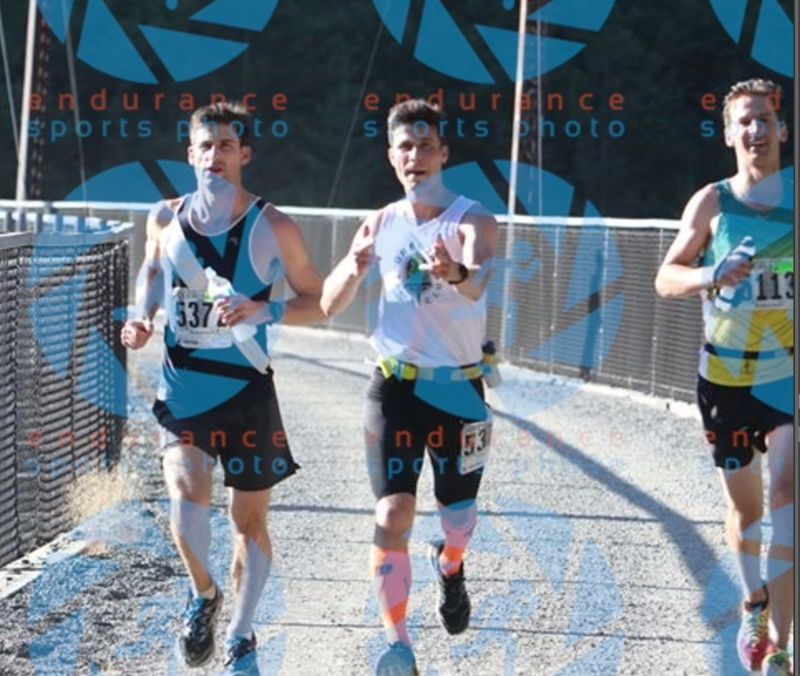 Yes, I was feeling that good at mile 3 that I was making jokes to the photographer. Miles 3-12 were really uneventful. We just held our pace, drank some water, took down some nutrition and made sure we were all feeling well. I ate the banana and I believe 3 gels. 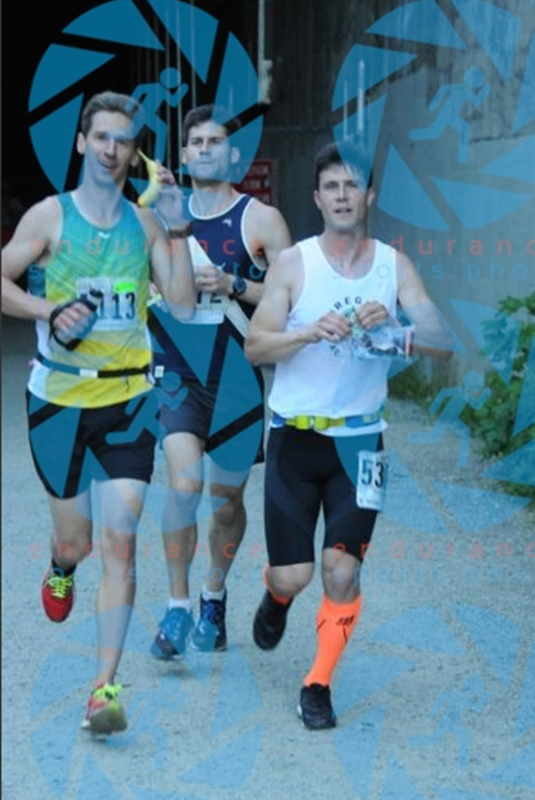 Once in a while someone would stop at an aid station to fill up their water bottle, get about 10 seconds behind us and then close that gap over the next quarter mile. Looking at my watch, my heart rate was around 155. In my best marathon my average was 166 for the whole race. So at this point I felt great and knew I was sticking to my conservative strategy. We crossed the half in 1:25:04 – just four seconds behind our target. Basically we were running like clockwork and barely breaking a sweat. My hair only looks wet in the picture below because I was dumping ice water on it as part of that cooling strategy. So we started to pick up the pace a bit. You’ll recall that before the race we dropped off a bag at the half way point – actually it was a bit beyond the half way point where there was road access to the trail. As we approached it we agreed on a 30 second stop. Jonathan was going to change shoes into his backup pair. I was going to get my frozen towel. Wes was going to grab a water bottle. We were all going to pee. We executed well and after that stop we got back moving again, now beginning to pick up the pace. After averaging 6:30 for the first half, our next splits were 6:16, 6:15 and 6:12. Somewhere in this stretch Jonathan got a cramp in his calf that he thought was related to changing his shoe. He started to worry it was going to get worse and that he wouldn’t finish. He was debating dropping out and trying to find another race a few weeks later to get his BQ, rather than running all-out, missing the qualifying time and being too injured to run another race. We talked it out and did some math. 16.2 miles in, we had been running for 1:45. With a BQ time of 3:05 that meant he could run 8:00 pace for the next 10 miles and still get it. Pretty reassuring, especially since we had just logged a few low 6s. I dug out a few salt pills from my water bottle’s pocket, handed those to him and convinced him to give it a few more miles. Our cheering squad was going to be at mile 21, so if he still felt bad then, he could drop out, but if he could hang at 6:30 until then, he would be able to hit 9:00 pace to the finish and still qualify. We backed off of the pace a bit and he was able to hang on. I think I had my 5th gel around this point but am not positive. Around mile 20 is when our pack split apart. I was really excited we were able to run this much of the race together after running the previous year’s race completely alone. We stopped to fill up our bottles, one of the longer stops and got split apart a bit. When we started running again Wes was maybe 15 seconds ahead of Jonathan and me. I picked up the pace a little, like we’d done the rest of the race to catch back up to each other, but he wasn’t coming closer, so I dropped back and ran with Jonathan for a bit. Turns out he wasn’t coming back because he had just clocked a 6:02 mile. Apparently as we got close to mile 20, Wes just clicked into the zone and was heading to the finish like a heat seeking missile. As we crossed mile 21 I decided to give it another go, I had hoped to catch Wes and that maybe we could work together to get the #2 or #1 runners. We weren’t sure how far ahead they were but knew that anything could happen at the end of a marathon. Jonatan was doing well, mostly recovered from the cramp, but clearly didn’t have a big push in him, so after making sure he was ok to hit at least those 8:00 splits I started pulling away. My wife and kids, along with Wes’ wife were cheering on the 21st mile. That ended up being one of the fastest of the day. My wife grabbed a shot as I passed by them, at this point I was about 20 seconds behind Wes and 20 ahead of Jonathan. 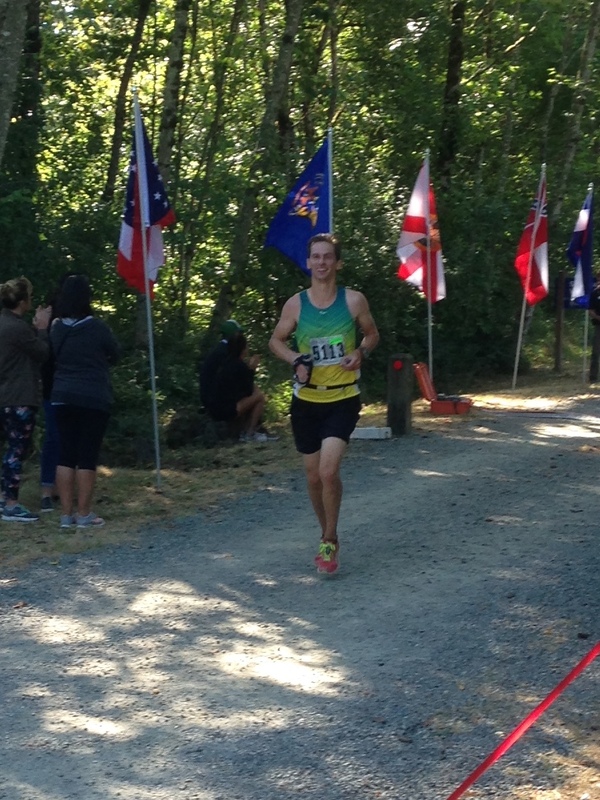 I look pretty happy & casual for a guy 20 miles in, logging low 6s. My next splits were 6:06, 6:04 & 6:10. 23 miles in I’m looking at 2:27 on the watch which means I can hit 2:45 or 2:46 if I keep this pace going. That would have been amazing – only 3-4 minutes slower than my PR from the year prior when I had double the training. My heart rate was no longer 157 though, I was up near 175, which is dangerous for me. 185 is about my max and I’ve found once I start going past 170 I tend to cramp or shut down within a mile or two. I was supposed to have a 6th gel around here, but skipped it because I wasn’t sure I could keep it down and I thought I was close enough to the finish. That was probably a bad move. My body can’t process the gel fast enough to use the energy consumed at that point for the race, but sometimes just putting them in tells your body it is ok to use the last bits of energy it has, because it knows there is something else coming. This was the tricky part about this race strategy, and using heart rate to gauge it. My heart rate was so low for the first half, that if I were going to try and get my average up to 166, what I had raced last time, I was going to need to be in the high 170s. But racing in the high 170s was begging for a crash. I felt the hurt happening. I noticed as I started worrying less about how far Wes was in front of me and more about how for Jonathan was behind me. I caught myself looking back for the first time, which isn’t a good sign. My next miles were a bit more relaxed, 6:30 and 6:45 with my heart rate at 168 and 166. This was probably healthy, but at this point the results were written. I was starting to crash. Jonathan had closed the ~30 second gap I had put on him during those two miles and caught me at mile 25. I had hoped to run it in together but he was actually running really strong, all that cramping business was behind him. Meanwhile I was getting worse with each step. This is where I start doing math in my head. I have 1.2 miles left to go I’m looking at about 2:42 on the clock. That means I can basically walk and I will still get my BQ. I know I can’t catch Wes or Jonathan at this point, set a new record for myself. There is no one else behind me as far as I can see. The only other milestone of note is the NYC qualifier at 2:53, which requires me to go about 9 minute pace – that is what I locked on. In retrospect, I was actually really close to hitting my second half goals. Had I thought about that a bit more and locked in on that target, perhaps I could have stayed around 7 flat and shaved that minute off my time to keep me in the 2:40s. I would have needed to keep my heart rate at 165, which is a pretty solid effort level, but not impossible. Unfortunately I wasn’t thinking about that, a clear planning failure, that is why it is always good to have some fallback goals, so that even if you miss your top goals, you still have something to push towards. Mile 26 was a 7:45 and the final .2 miles was around 8:30 pace. I crossed the line at 2:51:07. That means my second half was 59 seconds slower than the first half of the race. At mile 24 I was actually 2:45 ahead of first half pace, meaning I had gained 15 seconds per mile, but I was able to blow all of that and a minute more in a horrible last 2.2 miles. Despite that, it was a great finish. Our crew went 3, 4 & 5 and took home some age group medals. After the race we picked up our car from the start and had a picnic at a nearby park. 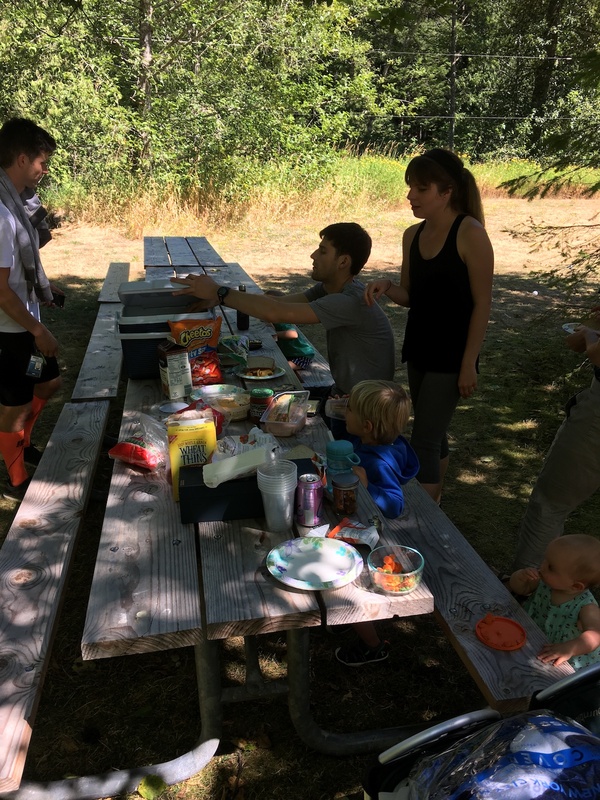 That ended up tying the whole season together nicely – what had started as a team plan, ended up as team training, a team race and a team meal. Very much different and more enjoyable than my solo experience in 2016, even if I was 9 minutes slower. Most races give our participant medals to every finisher – it is always nice when you walk away with an age group medal as well. Funny enough those always tend to be the smaller ones. That middle award is my favorite though. 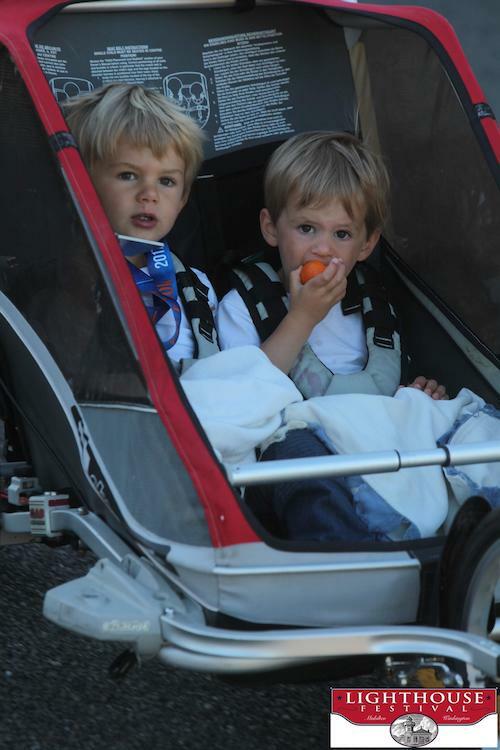 Half of my training runs had the stroller in tow and my boys’ favorite thing to yell was ‘go faster daddy’. I’m so happy they could see me in the race and be a part of that. 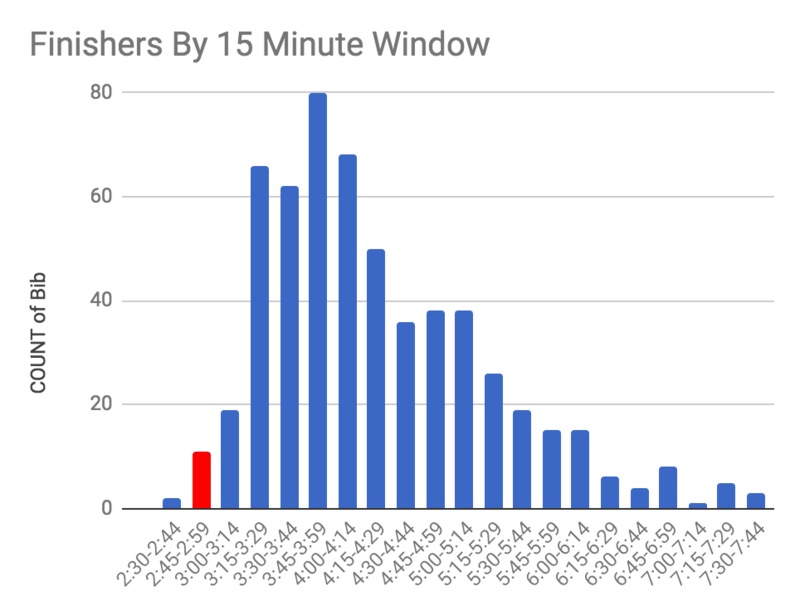 First, here is the breakdown of all finishers by 15 minute increments – I was in the red bar – not the top one this time. If we filter to just young males, 34 and under specifically, the results are a little less pronounced. Part of the reason the red bar is so high is our group of 3 who showed up together to turn in that time. The BQ time for these age groups in 3:05 – about 12 of the 45 finisher got it, which is really high. Its a fast course thanks to the continual slight elevation drop. 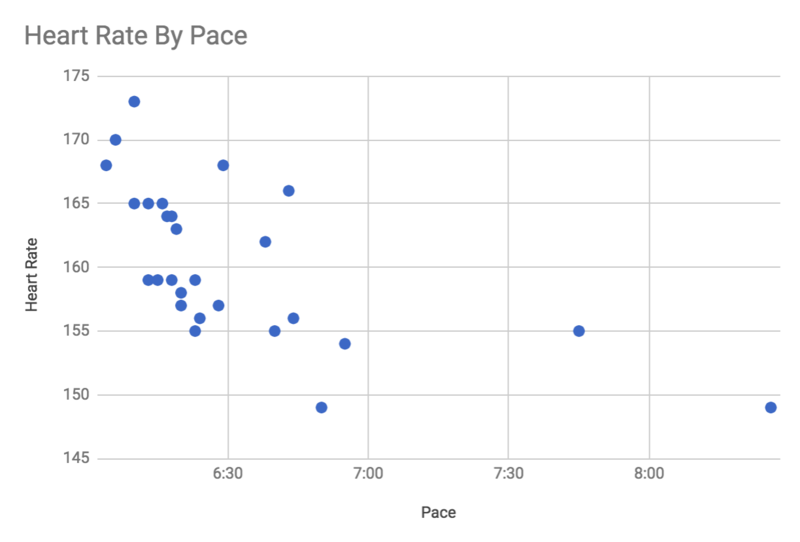 Looking at pace (blue line) and heart rate (red line), you can see 20 miles of a very consistent race pace with a continual heart rate drift. Basically it gets harder to run the same pace as the race goes on. That all starts to come apart around mile 23, but I managed to hang onto the pace until closer to 25. Drilling into just the heart rate, you can see I hit peak exertion during the 23rd mile. My cadence, how many steps I took per minute, was low early on as we started off at such a slow pace. It got up to speed around mile 3 though and stayed relatively consistent until mile 22, minus a stop during mile 13 to pee and a longer water bottle fill up around mile 19. In the end my cadence was dropping, despite my focusing hard on keeping it up, my legs just turned into bricks. Here you can see a scatter plot of my heart rate and pace for each mile of the race. Generally these follow a trend where the faster you are going the higher your heart rate is. Usually due to exhaustion, the latter miles are a bit slower, even at the same heart rate. Evidence of my crashing not being a complete lack of effort is clear in those two dots to the far right. Those are my last mile and 0.2 miles respectively. You can see that a 155 heart rate had gotten me around 6:20-6:40 earlier in the race, but by the last mile all it got me was a 7:45. That is bonking right there. 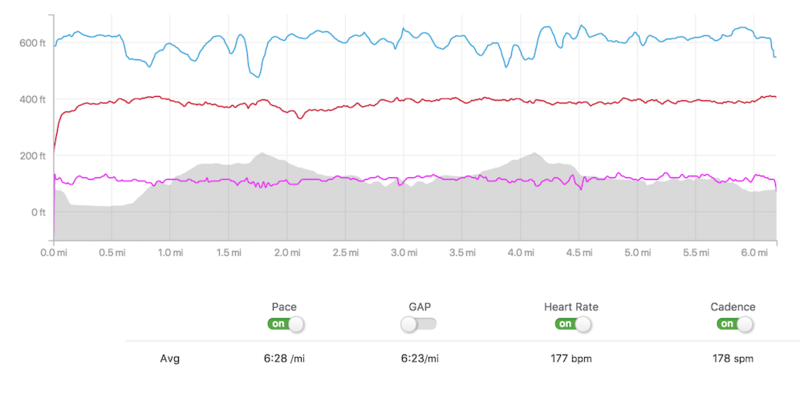 Another thing that stands out to me is that 166 bpm, the rate I averaged last year, would have gotten me about 6:15-6:20 per mile, according to a best fit line. That comes out to a 2:46 finish. I probably didn’t have the stamina to hit quite that level of exertion for that long, but a 2:47-2:49 definitely should have been possible. Here is a look at my breakdown at mile 25 compared to another runner. The red line is the distance between Coop and I at any given point. You can see we ran together the whole time an the deviance is usually GPS error. Around mile 20 I started to pull ahead and managed to get about 30 seconds ahead. Then around mile 22 or 23 he started to reel me back in. He made the pass at mile 25 and then immediately stopped to get some water, allowing me to pull a few feet ahead. I tried to go with him at that point, but I was just dead. That last spike from 25-26 looks much steeper than from 23-25. That is the difference between shutting down but fighting to get any speed possible and shutting down while giving up. I still ran into the finish, but there is a big difference in speed between digging deep and just running – especially at the end of a marathon. Here is my time compared to the winner of the race. We exited the tunnel around the same time and he slowly gained distance until mile 20 when I started going their exact pace for about 4 miles – I might even have gained some ground. I would have loved it if he had been there last year, his finish time was 2:39:18, which is about 3 minutes faster than I ran last year. Having him there the whole time would have given me someone to pace with though, so perhaps I would have been able to break 2:40 had he been there. This next chart is my heart rate per mile in all of my marathon races. 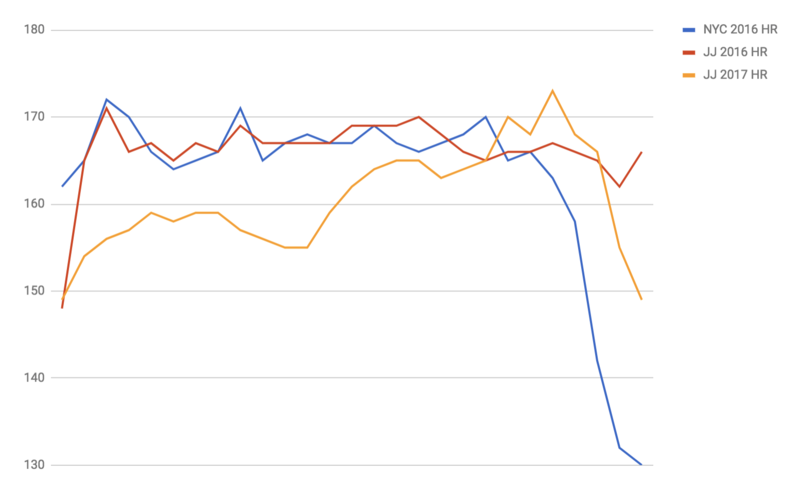 You can see the red line which is last year’s Jack and Jill, the race I won, is fairly consistent, with a slight drop in the latter miles but a strong finish. New York in blue started off higher in the first few miles, remained high and then crashed huge. This year’s Jack and Jill race, in orange is really interesting. Is is incredibly low for the entire first half, then quickly becomes the highest output I’ve ever had in the latter miles, until the crash. Had I been able to keep that orange line above the red line at the end, I’d be happy with my strategy and probably my time as well. We can see that in comparison to NYC 2016, this crash was about the same trajectory, but because it happened later, it didn’t end up getting as bad. In an ideal race, that crash starts happening at mile 26, but the excitement of the finish lets you push through it for just a bit and then you never see the drop on the chart. I think that is what happened for me in the red line, I was going to crash but decided to finish hard and did so just in time. In retrospect it appears like I just pushed too hard from miles 21-23 and that cost me the energy for the last mile. Had I gone 6:20 instead of 6:10, maybe I would have been able to go 6:20-6:40 instead of 8:30 at the end. What is so difficult about that idea is mile 21 seems like the right place to start pushing if you’re feeling really good and your heart rate is way below target. By this point you only have 5 miles left to make a dent in your time that you’ve been logging for 21. What I always try to identify after a race is whether the result was because of a training error, a race strategy error, and execution error or just a bad day. With the marathon it is so hard to tell because you can only race a few times per year. With the 5k in college I used to sometimes get really down after a slow race and think my training was off, only to have a great race the next week with the same race strategy and realize I just had a bad day the previous week. With this marathon, I’m really not sure what it is. It could be a training failure. I know I cut my training by a ton. I only ran 3 days per week, logged half the mileage and only had 3 20 mile+ runs leading up to the race, as opposed to 7 the year prior. But my expectations weren’t to get another low 2:40s, I would have been happy with a negative split and 2:49 finish and ecstatic to finish with Wes around 2:47. I can’t blame the race strategy that much either, because three of us ran that strategy and the other two ended up doing great. I think it comes down to a bit of execution failure. I missed my half way cool down towel because it was too frozen, I didn’t eat as much as I had wanted to, especially near the end, and I pushed a bit harder than I would have liked to during miles 22 & 23. Combine that with what was possibly just not a great day and I think that is difference between a crash that cost me 2-3 minutes and an otherwise strong finish in the high 2:40s. One final interesting point. This race actually ran twice over the weekend, once on Saturday and once on Sunday. Had we been there Saturday and ran the same times, we would have ended up 1, 2 & 5 instead of 3, 4 & 5. Having those other runners closer to us might have been enough to change things a bit though – perhaps they would have gone faster if there were competition, or perhaps we would have gone faster knowing we could pull 1, 2 & 3. Either way, it is interesting how races often come down to a bit of luck and who shows up on a given day. I qualified for the Boston Marathon with this race, so I intend to go out and run that in the spring. That course is a bit slower, but there will also be a lot more runners around my pace for me to group up with. I’d like to try the same training plan, except focus a bit more on finishing stronger. I’ll likely emphasize more long runs where the last few miles are at race pace to get me into the mentality of digging deep when it seems like I have nothing left. I’ll also try a similar race strategy, with a conservative start and courageous finish. Probably aiming for the same paces, hoping to hit 1:25 and sub-1:25 for the two halves. On Boston’s course a 1:25 first half will seem a little less conservative and so I won’t try to run any 6:00-6:10s in the second half, I’ll probably aim for 6:25s or so with a strong finish to just barely hit a negative split. 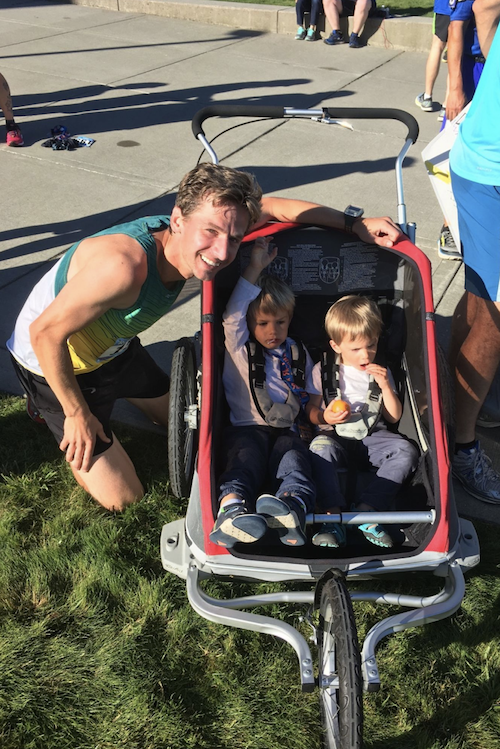 On August 26, 2017 I ran the Run-A-Muk 10k while pushing two children in a double stroller, finishing in 5th place overall with a time of 39:58. Here is the race report. My first ever race with a running stroller. 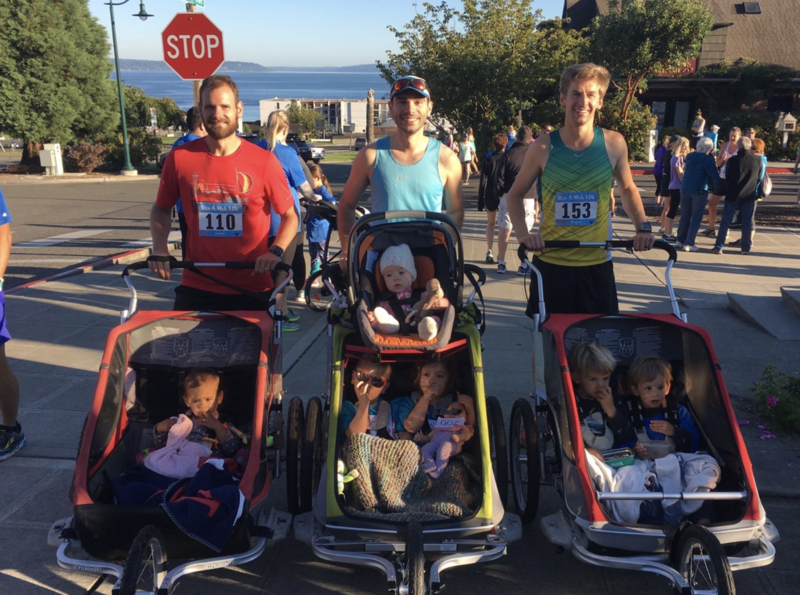 I was invited by my friend Abram (who is also my brother-in-law-in-law) who was putting together a group of dads that were going to run the race with strollers. Throughout 2017 I got pretty good running with the stroller, bringing one or two kids on more than 50% of my runs. 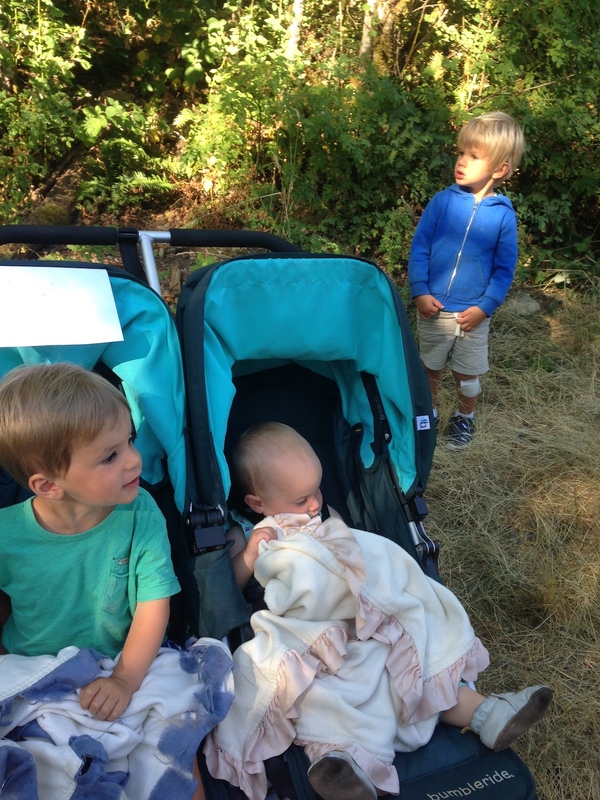 I had mastered the art of snack management for keeping kids occupied, I had made adjustments to the stroller to allow me to clock sub-6 miles, I had even turned my kids into an onboard cheering unit, ‘run faster Daddy’ their cry whenever I slowed down (even if because of a hill). This race let me put that all to the test. 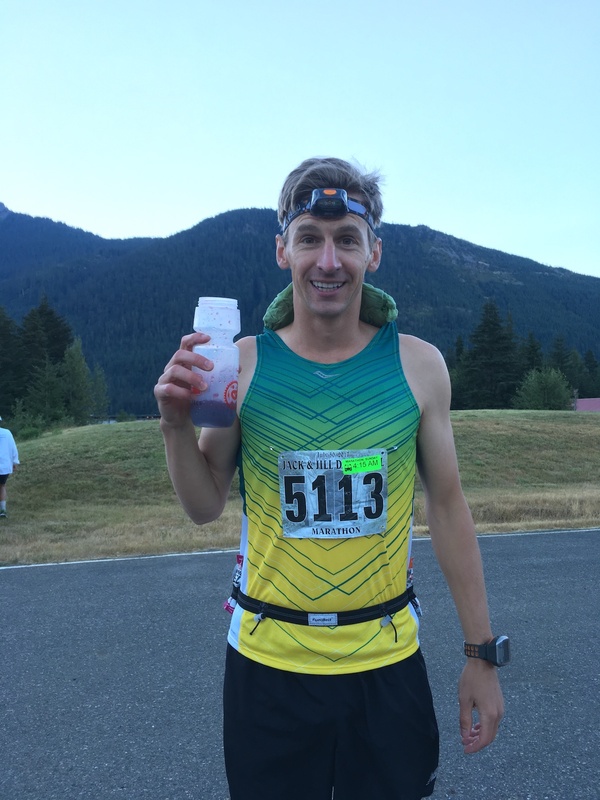 I write this race report with my tongue in my cheek, it was a local fun race, mainly an excuse to get our families together, but I ended up winning my age division and getting 5th place overall, despite my 90lb handicap. I would be running with my 2 & 3 year old for this race. (~30 & ~25 lbs for those wondering) My stroller of choice is the Chariot Cougar 2. It is a multi function child carrying vehicle that can be used as a bike trailer, running stroller or sled. It weighs in at ~32 lbs, bringing my total weight to 87 lbs). I modified the handle to get it a bit higher and farther out which lets me run at full stride without kicking the back – I found that with the original handlebar I would kick the stroller if I dropped much below 6:30/mile. Getting into position at the start of a race when you have a stroller is a bit tricky. Usually, without one, I just slip in at the front after doing some strides just before start. With the stroller, I had to line up a bit early to block out enough square footage for my profile and I couldn’t move at all once I was there. A few people stumbled over the stroller, as most people are used to shoulders marking taken space in a start corral and weren’t expecting a wheel. Fueling is really important for longer races – don’t eat enough early and you’ll risk bonking at the end of the race. For a stroller 10k it is equally important – give your kids their snacks too early and you’re risking a breakdown at the end. I brought three things for each child: a container of cereal with berries (it is small, so it takes them a long time to eat), a container of goldfish & raisins (their favorite, so promises of it motivates them) and a lollipop (it fully occupies their mouth for as long as it lasts, so there won’t be any crying or complaining). I had planned to use the cereal at the start, the goldfish at the turnaround and the lollipop for the final miles. Turns out I hadn’t planned for breakfast so I used the cereal & berries pre-race and they had mostly finished it before the race started. The gun went off and like always in a local 10k, everyone raced out of the gates at a pace much faster than they could maintain. Someone made a quick lateral and almost ate it on our front wheel, I ended lifting the wheel to move it out of the way, but that maneuver caused me to veer off course and almost resulted in me taking out the starting gate arch. I recovered though and nobody (nor any structure) went down. The first 1/10 a mile is downhill and I was swerving to pass people. The next half mile is really flat and I used a bell I had brought to call people out of the way. I worked my way until I realized the leader was just a bit ahead of me. I hadn’t planned on being that close to the lead but though that now that I was, I should see if I could grab it. That is when we hit the 1 mile long uphill that climbed just under 200ft. Normally I do really well at uphills, but the thing about gravity, is it slows you down more the more weight you have. Having a 90 lb stroller in front of me down by over a minute per mile, and the other runners started passing me back. I crossed 180 beats per minute and was really working hard. The next mile was downhill though, 100 ft change, about half as much as the uphill I had just come up. As soon as I crested the hill my speed picked up and I started passing those runners back. I then attempted a very advanced move: putting away the empty snack containers, and getting out a new snack while holding a 5:40 mile. Worked like a charm. Only problem is that snack was supposed to be used after mile 3 and I was only at mile 2. By this point of the race I was in 5th place and as it would turn out I wouldn’t pass anyone or get passed for the rest of the race. Mile 3 and we turned around. The race had started on a road but eventually dropped to just the bike lane & sidewalk. Cars were still using the road, and despite them being careful, it meant that crossing the line was a major no no. Heading back, I was in the same bike lane I had just been, except now I was running straight at the 129 people. Thankfully most people were very kind and hopped up onto the sidewalk to let me keep running – hopping up onto the sidewalk with a stroller wasn’t really possible. I did pass the other stroller-dads and we gave each other some good cheers. The path back was the exact opposite, up the smaller hill first and then down the bigger hill. I held steady around 180 bpm and kept chugging along. Sometime around mile 4 I handed out the lollipops and prepared to give it all I had to see if I could catch anyone else. I gave it a good race effort & ended up crossing sub-5 a few times on the downhills. I was zeroing in on the 40 minute mark, which was 6:30 per mile. I had thought would be appropriate based on a recent marathon effort at 6:30 per mile – this was shorter and the equivalency charts predicted me at 6:00 per mile, I added ~30 seconds for the stroller. I ended up crossing at 38:58 and hitting my 40 minute goal. I guess it wouldn’t have mattered if I didn’t, but I’m glad to be able to have come in just under time. Post race, the kids go the experience the joys of all sorts of snacks and a medal they took turns wearing. I think this was a great way to expose them to racing and it went along nicely with a race they watched me run earlier in the year and a kids race they would both run later in the year. Here is our full group, four dads, 8 kids it tow and two others on the way. A great time. 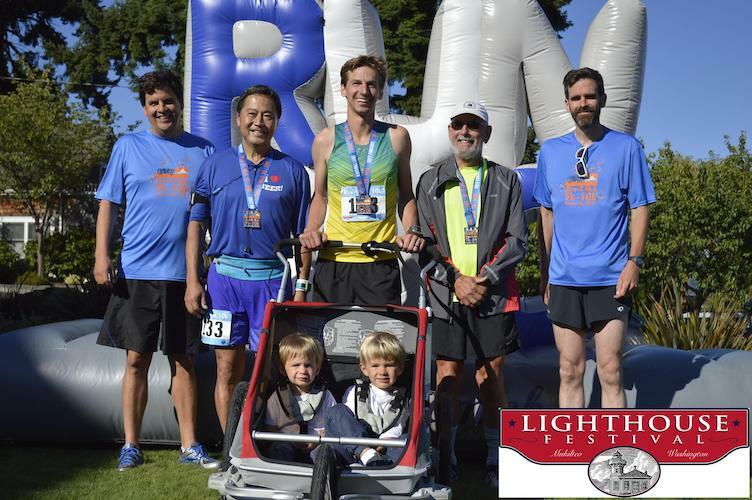 I ended up winning my age group, here is me with the other age group winners post-race. I’ll keep this analysis brief. My pace bounced around a good bit, but that is because the extra weight of the stroller made uphills hurt more than usual and downhills help a bit more. The fastest speed I hit was 4:47 and my fastest mile was the final one, which came in at 5:56. Average was 6:28, which is where I wanted to be. Heart rate wise, I quickly spiked to over 180, which is where I want to be for a 10k. I let off the gas a bit as I peaked the first hill, after that brutal climb with the stroller, I was glad to catch my breath, but shortly thereafter started working my way back up. From mile 3-6 I stayed pretty steady in the high 170s for an average of 177. I think I could have been a bit higher. 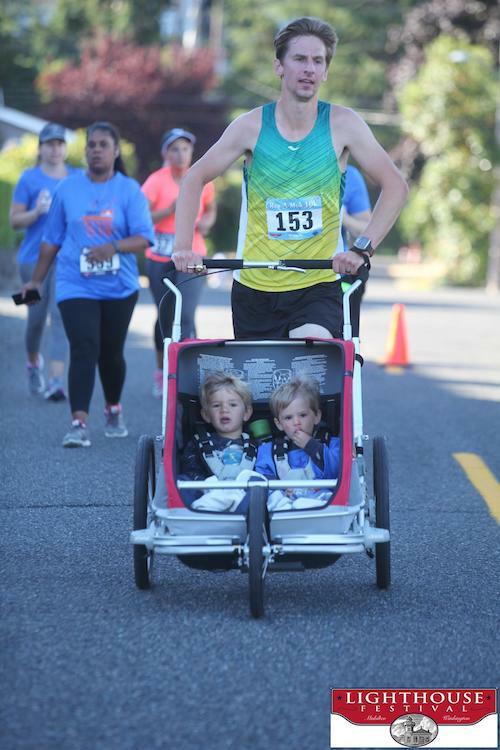 I really liked doing a stroller race, it was fun having the kids with me, the stroller added some extra mental stimulation and the handicap meant I had more competition to run with in a race I would have handily won otherwise. I’ll definitely consider it in the future for local races I’m running for fun. A word of advice though, not all races are good for having a stroller. This one worked out because there were only ~150 runners and it very much had a local vibe. The website mentioned it was stroller friendly and we contacted the race director ahead of time to clear it. I’d suggest doing the same if you intend to run fast with a stroller as opposed to staying in the back, which is what some races expect.